Toronto, Ont. 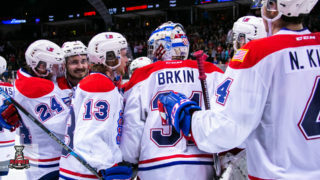 – The Canadian Hockey League today announced the week eight edition of the Kia CHL Top-10 Rankings for the 2018-19 season. The weekly rankings of the CHL’s Top-10 teams are selected by a panel of National Hockey League scouts. Holding firm in the top spot for a fourth-straight week were the Prince Albert Raiders, who easily handled their lone game of the weekend, a 7-2 win over the Kootenay ICE Saturday at home. While the impressive starts to the season by Brett Leason and Ian Scott (Toronto Maple Leafs) continued to hold true, the team received a three-assist performance from rookie import Aliaksei Protas, continuing his strong season. The product of Vitebsk, Belarus has 17 points (4G-13A) in 17 games. That includes an impressive 13 even-strength points, including all four of his goals. 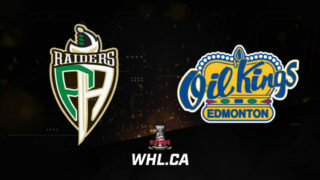 The top-ranked Raiders are back in action Friday, November 9 (7:00 p.m. CT), playing host to the Swift Current Broncos as they continue a five-game home stand. Rising two spots this week to fourth were the Vancouver Giants, who were victorious in their lone game of the week. 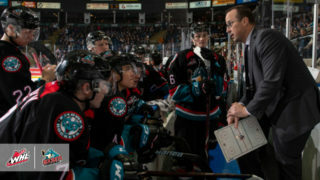 Downing the Kamloops Blazers by a 2-1 score last Saturday, the Giants moved to 7-0-1-0 against their four B.C. Division opponents this season, also improving to 5-0-0-0 when leading after the first period. 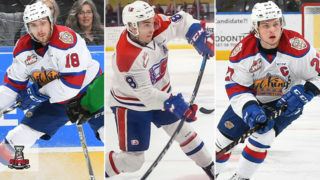 The Giants have a three-way tie for scoring on their team with Milos Roman (Calgary Flames), 2019 NHL Draft prospect Bowen Byram, and Brayden Watts each sitting with 14 points this season. 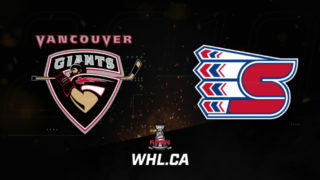 Leading the Western Conference with a 12-3-2-0 record, the Giants will continue their eight-game home stand Saturday, November 10 (7:00 p.m. PT) when they play host to the Prince George Cougars. Also rising in the Kia CHL Top 10 Rankings were the Red Deer Rebels, who held firm in their lead of the Central Division. A 34-save performance from 2019 NHL Draft prospect Ethan Anders guided the Rebels to a win in their lone game of the past week, a 1-0 result against the Calgary Hitmen. 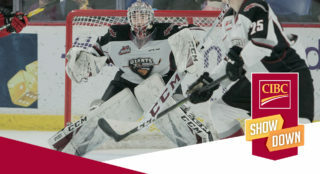 The performance also earned Anders the honours as the WHL Eli Wilson Goaltending Goaltender of the Week. The Rebels return to action Friday, November 9 (7:30 p.m. CT), taking on the Brandon Wheat Kings. Earning an honourable mention this week were the Tri-City Americans, who doubled up the division-leading Everett Silvertips by a 4-2 score in their lone game of the week. Captain Nolan Yaremko has led by example this season, placing eighth in WHL scoring with 25 points (11G-14A) through 14 games. The product of Spirit River, Alta. will look to continue his four-game point streak and three-game goal scoring streak as the Americans head north for a six-game road trip through the East Division. The trip begins Friday, November 9 (7:00 p.m.) with a date against the Regina Pats at the Brandt Centre.